Vietnam, 20 dong, 1989. Ho Chi Minh commemorative. 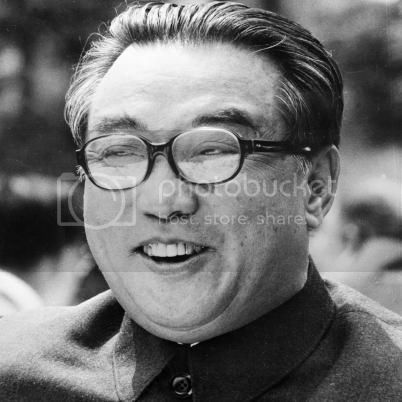 Kim Il-Sung (1912-1994), the father of communist North Korea, began his political life by fleeing Japanese rule of his homeland. After some Soviet training and membership in a local communist party, Kim returned to Korea during World War II and established a communist government in 1948. While promising great wealth for his country, Kim suppressed his people and fashioned a militaristic society. In 1950 he instigated the Korean War, in an attempt to reunify the peninsula, but he was rebuffed by U.S. and UN forces. From the mid-1960s, he promoted his self-developed Juche variant of national socialist organisation, which later replaced Marxism-Leninism as the ideology of the state in 1972. When Kim Il-Sung died in 1994, his son Kim Jong-Il succeeded him. The North Korean government refers to Kim Il-sung as "The Great Leader", and he is designated in the North Korean constitution as the country's "Eternal President". His birthday is a public holiday in North Korea. North Korea, 10 won, 1992. Kim Il-Sung's 80th birthday. North Korea, 20 won, 1994. Death of Kim Il-Sung. Somalia Bimetallic 250 shillings 2000 millennium icons - Che Guevara. Mongolia just issued two coins (one silver, one gold) that commemorate Fidel Castro. More information about the silver piece is here; somewhere at the bottom you find a link to the gold version. Below is an image from the Coin Invest site.